Colin Rand Kaepernick (born November 3, 1987) is an American football quarterback for the San Francisco 49ers of the National Football League. He was drafted in the 2nd round, 36th overall pick in the 2011 NFL Draft. He played college football at Nevada. Kaepernick was born in Milwaukee, Wisconsin. 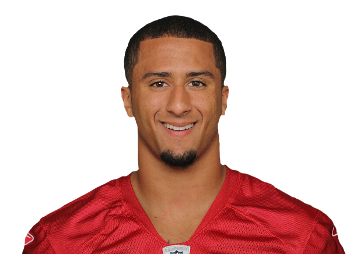 An adopted child of Rick and Teresa Kaepernick, Kaepernick is of mixed European and African descent and the youngest of their three children. He started youth football at the age of eight years old in Turlock, California, and played sparingly as a defensive end and punter. He then became his youth team's starting quarterback at age nine. He completed his first competitive pass for a long touchdown. He went on to win several punt, pass, and kick competitions mainly on his passing ability. A three-sport star at John H. Pitman High School in Turlock, Kaepernick passed up a promising baseball career as a pitcher in order to play football. Kaepernick was nominated for all state in football, basketball, and baseball his senior year. He was the MVP of the Central California Conference in football leading his school to its first ever playoff victory. In basketball he was a first team all CCC selection at forward and led his 16th ranked team to a near upset of the number 1 ranked Oak Ridge Trojans in the opening round of playoffs. In that game Colin scored 34 points, although that was not enough as Ryan Anderson socred 50 to best the Pride.